Note: The Navy Plans to merge this rating with the Hospitalman Rating (HM) rating, effective 1 October 2005. For details, see NAVADMIN 214/05. Dental technicians perform duties as assistants in the prevention and treatment of oral disease and injury and assist dental care professionals in providing dental care to Navy people and their families. They may function as clinical or specialty technicians, dental administrative personnel and dental care providers at dental treatment facilities. They also serve as battlefield technicians with the Marine Corps, rendering emergency oral/ dental treatment to include initial treatment in a combat environment. Qualified dental technicians may be assigned aboard ships, Fleet Marine Force units, Seabee units, and branch dental clinics. Dental technicians normally work closely under the supervision of a Navy dental officer. This is a five-year enlistment program. 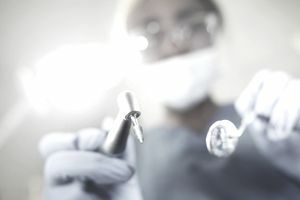 The duties performed by DTs include: assisting health care providers in the prevention and treatment of oral disease and injuries; preparing dental materials and medications; exposing and processing dental X-ray films; rendering emergency dental first aid; instructing patients in oral hygiene; performing dental administrative, supply and accounting procedures; maintaining treatment records and reports; "chair side" assists. Must have normal color perception. 60-month obligation. Notes: Applicants must be informed that they will be assigned to duties involving direct patient care and clinical services and may be assigned to the Fleet Marine Force for duty. A licensed physician or dentist licensed or graduate of medical or dental school in any country is not eligible for this rating. No history of drug abuse or commission of offenses involving alcohol, narcotics or other controlled substances with the exception of experimental or casual use of marijuana. Applicants must be of the highest standards as requirements are strictly adhered to before accession into the HM /DT community. Enlistees are taught the fundamentals of this rating through formal Navy school training. Advanced technical, specialty and operational training are available in this rating during later stages of career development. Materials and procedures used to assist dental officers Individualized instruction and practical application After "A" school, DTs may be assigned to Naval Dental Centers/Clinics, Naval Hospitals, Branch Dental Clinics at shore stations in the United States or overseas, dental clinics aboard ships, mobile construction battalions (Seabees) or in dental companies with the Marine Corps. If initially assigned to a Fleet Marine Force (FMF) unit or the Seabees, DTs first go to Field Medical Service School at Camp Pendleton CA, or Camp Lejeune NC, for five weeks of specialized training required to provide dental medical services in the field. During their careers in the Navy, DTs usually spend 30 percent of their time assigned to fleet units or FMF units and 70 percent to shore duty. Dental technicians work in a variety of environments. Most DTs work indoors in hospitals or clinics. Others work aboard ships with FMF or Seabee units. Duties are service oriented, repetitive and require good judgment and mental alertness. DTs normally work closely under the supervision of a Navy dental officer.